1988 Irwin 43CC This 1988 Irwin 43CC has been completely redone. Numerous upgrades and improvements including cockpit enclosure, new main and genoa, dripless shaft, new water heater, radar, chartplotter, wind machine, TV/DVD, inverter, refinished cabin flooring, refrigerator/freezer, barrier coat, new fuel tank, electric head, AC/heat, and new batteries. Numerous other improvements, and all maintenance done on at least an annual basis. This is a classic beauty, with ample space below for living. The Ted Irwin designed center cockpit is great Bay cruiser! 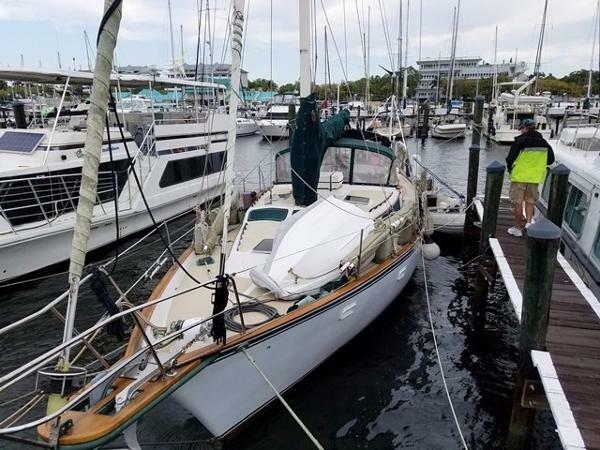 1986 Irwin 43 Mk II Cruiser 1986 Irwin 43 MK II Ready to see the world? Sail this Ketch/Cutter around the Globe. She is Clean, Cozy and Seaworthy. Powered with a strong Yanmar diesel. New Westerbeke Gen set has only 284 hours on of use. Windlass Anchor, VHF, Auto Helm, Auto Knot Meter, Auto Wind Gauge, Furuno GPS, Raytheon Radar. Two staterooms with two separate heads. Full Galley with a Stove and Ice box. Three AC units. One 16,000 BTU in the Main Salon. Two 6,000 BTU units in the Aft and Master Staterooms. Come see this beautiful boat. She is ready to go! Irvin Mark III 43 feet . Fiberglass Hull Full Keel Sloop Blue Water Cruiser. Center Cockpit Ideal for Live aboard full queen sized bed. Big Cruiser Jib with V Cover. Brand New Main Sail Cover and Bimini. Windshield. 66 Horse Power Yanmar Desiel Autopilot. Custom made Teak inside Interior with Custom made rotating chair in a state room. Two Bathrooms Two electrical manual heads. 10 feet inflatable Caribe with 6 HP Yamaha Outboard. Selling as is. Full Financing and Delivery Available! 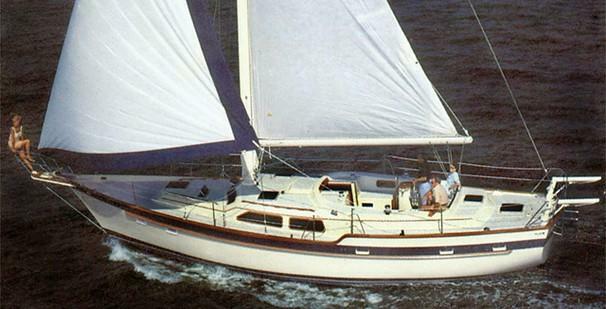 "Nirvana", a 1987 43 foot Irwin Mk III, has had only two owners within the same family since her purchase. 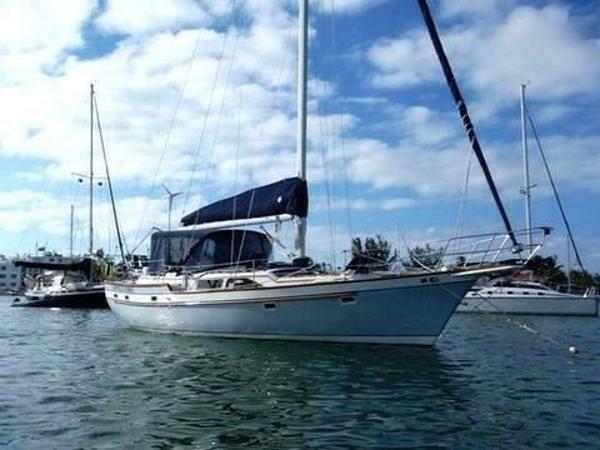 She has always been sailed a lot and regular maintenance performed to insure great cruising reliability. Never neglected, she has been hauled every year for below waterline maintenance. "Nirvana" has had many significant replacements that will save her new owner a lot of money and worry for the future cruising years. Consider these recent significant replacements and upgrades: -2009 New 75 hp Yanmar 4 cylinder turbodiesel(New exhaust hose, waterlift muffler, seacock, and thruhull fitting). -2014 New stainless steel rubrail portside -2013 New shrouds, backstay, forestay, and topping lift -2013 New vhf antenna, masthead light, anchor light and spreader light -2013 All diesel fuel was removed from the 105 gal tank and the tank thoroughly cleaned to remove all foreign matter. 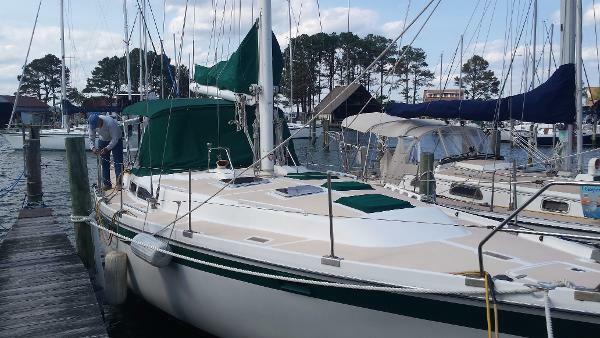 New fuel was added -2012 New 9 oz fully battened Mainsail with two reef points -2012 Two new 8D heavy duty batteries -2011 New Cruisair 12000 btu digital reverse cycle ac/heat -2011 New Charles Battery charger (35 amp HQ series) -2010 New 8.3 oz jib with navy sumbrella uv cover -2010 New rudder bearing -2009 New Navy sumbrella bimini, dodger with full enclosure -2009 Mainsail Mackpack with lazy jacks -2005 Garmin GPSMAP chartplotter(color graphics) -2004 dripless packing gland -2004 New Steering cables and Teflon coated conduit -2004 New stainless steel shaft -2004 New cutlass bearing -2003 New life lines -2001 Waeco refrigeration As a minimum haulout every year means sanding the bottom and application of three gallons of antifouling paint. The topsides are polished with 3M Marine Compound and Finishishing Material and protected with two coats of wax to keep that new boat shine on the gelcoat. New zincs are installed. Inspection of the cutlass bearing and rudder bearing is performed with replacement if necessary. All running rigging has been replaced within the last five years. The brightwork on the deck is varnished and beautiful. Most surfaces have six coats. When you go below decks you won't get that old boat mildew smell because she is used often, well ventilated, and the central heat and air conditioning system is used throughout the year for proper climate control. Most of the teak surfaces(bulkheads, doors, and trim) are also finished with several coats of varnish to seal and protect the wood. The cabin sole is also varnished throughout the vessel. More specific information and pictures will soon follow this listing.